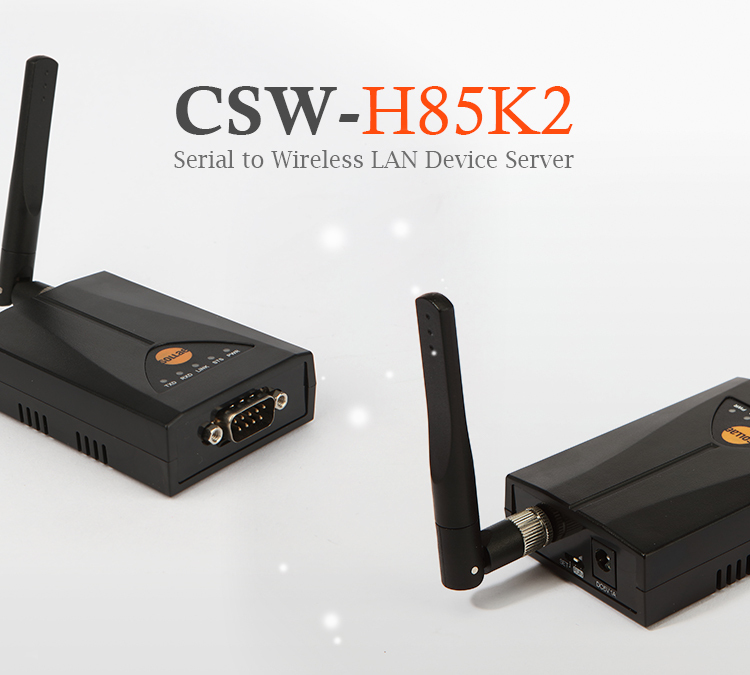 CSW-H85K2 is a serial WLAN device server that converts data of serial devices without TCP/IP function to TCP/IP data in compliance with the IEEE802.11b/g WLAN standard. It supports RS422/RS485 as well as RS232 interface. Wireless network communication function is provided by simple connection. Therefore, various industrial serial devices can be monitored and controlled remotely. CSW-H85K2 supports the Wireless RSSI mode. IPv4/IPv6 Dual Stack, and Address Auto Setting function. Above all, there is a feature that can be set without AP by mobile devices such as smart phones or laptops through Soft AP function. In addition, its embedded WPA-Enterprise security protocol further enhances data security, while maintaining high reliability even in special environments where enterprise security is required. CSW-H85K2 can be easily applied to environments where wired work is difficult, and is especially suited for a variety of applications including Internet sign boards, automatic remote meter reading, and patient monitoring devices.